December 30, 2015 - Morgan Aircraft which was founded in 2005, had a vision to build and manufacture Vertical Take-Off and Landing (VTOL) general aviation jets and Unmanned Aerial Vehicles (UAVs), has filed bankruptcy as a result of the company not being able to meet its financial obligations to its creditors. Court records shows the Sheboygan County Memorial Airport, Wisconsin based company filed for receivership which will allow a court appointed receiver to dissolve and sell off the company's assets in order to pay its creditors. At present, the company owes Oostburg State Bank more than $1 million. Morgan Aircraft had hoped for an early cash flow and profitability by developing hybrid aircraft using lighter-than-air (LTA) with heavier-than-air (HTA) technology and selling its intellectual property rights licenses on its general aviation jets, UAV and other military or government aircraft that it developed. Morgan Aircraft was conceived out of the need to better serve passengers needs to and from airports by eliminating ground travel. The company recognized that in order to accomplish this feat passengers would be required to take a helicopter, but the company also recognized that would create a greater cost versus the automobile. 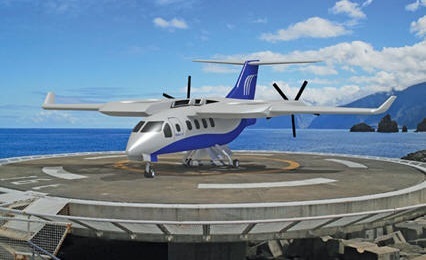 The company's idea was to build an aircraft that could depart from anywhere like a helicopter but would be able to achieve the same distance and speed of an aircraft. The company's solution was to build an aircraft that would provide a stable VTOL flight and a direct point-to-point travel that provided speed, range, and comfort of a business jet, Extremely Maneuverable Jet (EM-J). In August 2009, Sheboygan County and Morgan Aircraft entered into a 50 year airport lease and development agreement. Sheboygan County began $1.3 million of infrastructure improvement plan that included grading for a new taxiway and apron, building an access road, creating water retention areas, and installing security fencing and utilities. In August 2011, Morgan Aircraft founder Brain Morgan announced the State of Wisconsin had provided the company with working capital loan of $1 millions through a public financing Community Development Block Grant for Economic Development (CDBG-ED). "In securing this CDBG-ED loan, Morgan Aircraft is committing to invest $105 million by2015 for phase 1 aircraft development, and create 340 new fulltime positions by December 31, 2015." Wisconsin Economic Development Corporation (WEDC) CEO Paul Jadin said at that time “Morgan Aircraft is the type of private company on a growth trajectory that will significantly help create 250,000 jobs in Wisconsin by 2015. The WEDC is pleased to assist Morgan Aircraft with this exciting project. I look forward to their long-term success in Sheboygan County.” Morgan also announced the company had raised $8 million and it had “quietly made progress toward completing its technical validation process and significant engineering advances in both the airframe and power train configurations”. In 2012, the company had signed a “strategic cooperation agreement” with UK-based Mineseeker to develop a unmanned aerial vehicle (UAV), “but with none of the tilting parts which have plagued other such programs in the past.” Mineseeker press release - "Wisconsin USA-based Morgan Aircraft LLC and UK-based Mineseeker Operations announced today (January 9, 2012) that the two organizations have signed a strategic co-operation agreement to jointly develop an unmanned aerial vehicle (UAV) platform that can, in addition to serving many other needs, be customized to meet the mission requirements of Mineseeker Operations."